Buffalo Bill and Albert Edward. 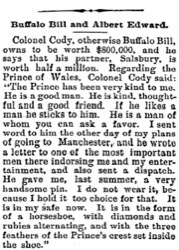 Colonel Cody, otherwise Buffalo Bill, owns to be worth $800,000, and he says that his partner, Salsbury, is worth half a million. 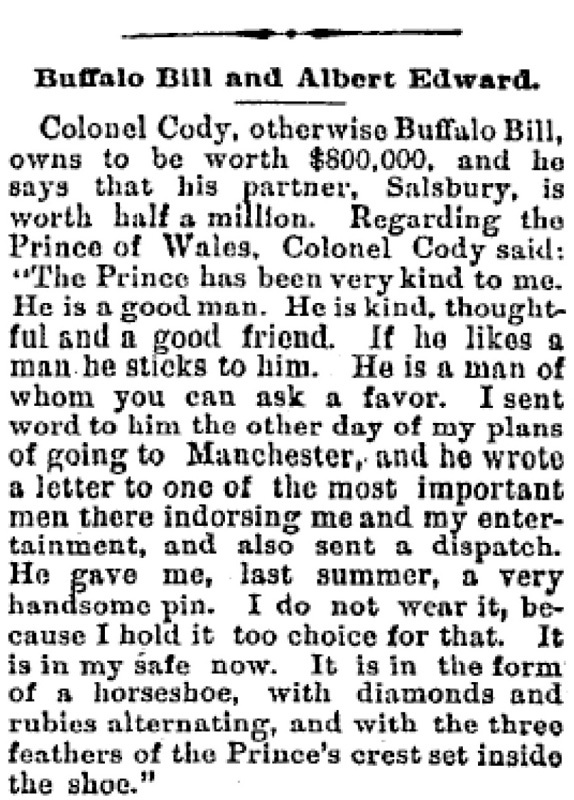 Regarding the Prince of Wales, Colonel Cody said: "The Prince  has been very kind to me. He is a good man. He is kind, thoughtful and a good friend. If he likes a man he sticks to him. He is a man of whom you can ask a favor. I sent word to him the other day of my plans of going to Manchester, and he wrote a letter to one of the most important men there indorsing me and my entertainment, and also sent a dispatch. He gave me, last summer, a very handsome pin. I do not wear it, because I hold it too choice for that. It is in my safe now. It is in the form of a horseshoe, with diamonds and rubies alternating, and with the three feathers of the Prince's crest set inside the shoe."